File photo Greene County Animal Care and Control volunteers and adoptable pups walk during the Shelter Break-Out 5K May 12, 2018 on Creekside Trail. This year’s GCAC 5K will be held Saturday, May 11. XENIA — Dogs and their humans can join adoptable shelter pups for a walk or run at Greene County Animal Care and Control’s (GCAC) Breaking Out 5K 10 a.m. to 2 p.m. Saturday, May 11 on Creekside Trail. GCAC volunteers will walk adoptable dogs sporting commemorative bandanas during the event. Adoptions can be done on-site at the agency’s mobile unit. All proceeds will go to GCAC’s dog and kennel fund and directly benefit the animals served at the agency. The 2019 event will also include a variety of food and other vendors on the lawn at the park. Registration will begin 9 a.m. at Greene County Parks & Trails’ (GCP&T) James Ranch Park, 177 Fairgrounds Road. Participants will travel along the adjacent Creekside Trail. Participants can also pre-register at GCAC 9 a.m. to 6:30 p.m. Monday through Friday, 12-4 p.m. Saturday and Sunday, or online at https://bit.ly/2FtyGoB. The $25 registration fee includes a free T-shirt, wag bag and Greene County Animal Care and Control slip-on leash. All proceeds benefit GCAC. For more information, call GCAC at 937-562-7400 or email jtaylor@co.greene.oh.us. 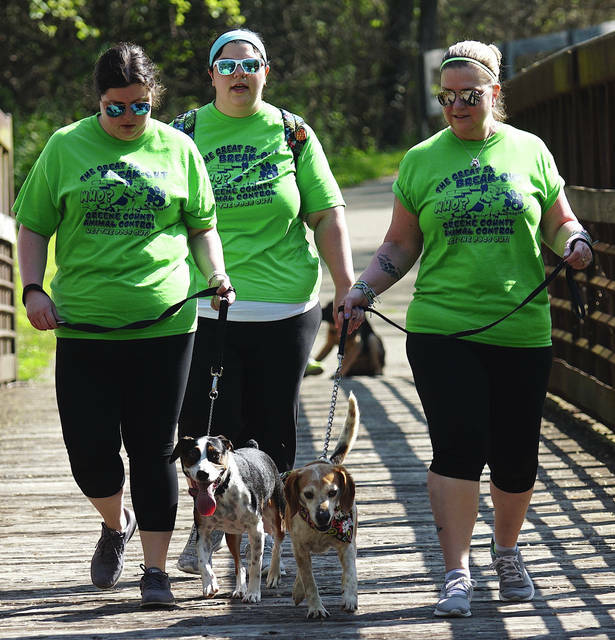 https://www.fairborndailyherald.com/wp-content/uploads/sites/50/2019/04/web1_GreenWalking.jpgFile photo Greene County Animal Care and Control volunteers and adoptable pups walk during the Shelter Break-Out 5K May 12, 2018 on Creekside Trail. This year’s GCAC 5K will be held Saturday, May 11.